Ferrari unveiled its highly anticipated F1 car for the 2012 season in bizarre conditions and many sites, Jalopnik included, are deeply confused and discouraged by the new racer. Click through for more details on this monumental failure. The aerodynamics appear to be greatest failing of this car, named the F151 Tributo a Spiriti, though some sources close to Ferrari hint that the venerated manufacturer has devised some clever active downforce systems capable of enacting such pressure on the 640 kilo car to make it grip the tarmac as if it weighed over 5,000 pounds. 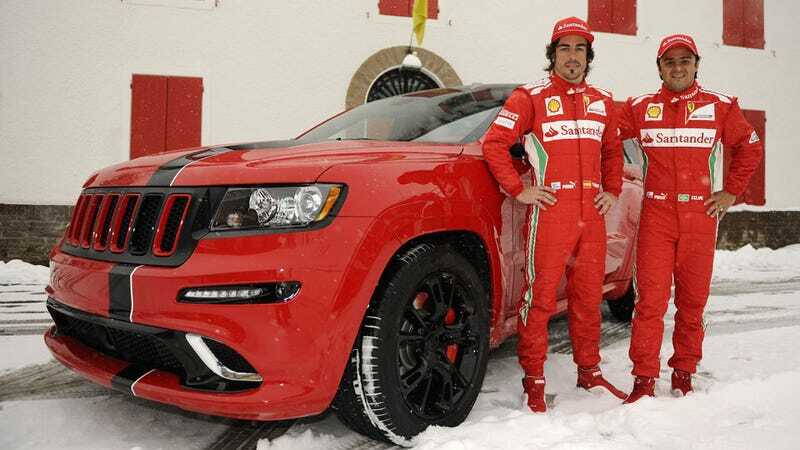 It was Beth Peretta, Director Marketing and Operations for SRT Brand and Motorsports in Chrysler, a company also owned by Ferrari's parent company Fiat, who addressed the press on this snowy day at the Maranello test track. We are sure Fernando and Felipe will feel perfectly at home at the wheel of these cars…that represent the pinnacle in terms of performance for…all who love driving…and technology. We at Jalopnik are not convinced. This smacks of badge engineering to us. We know we've seen that shape somewhere.